Berkshire Freemasons are at it again. For the third time in recent weeks members of Hungerford Lodge have been out presenting a cheque to a local good cause. Following their donations to Great Bedwyn School in December 2014 and, more recently, to projects at John O’Gaunt and Shalbourne CofE Schools, it was back to Great Bedwyn. This time it was The Bruce Foundation who have benefitted from their benevolence. 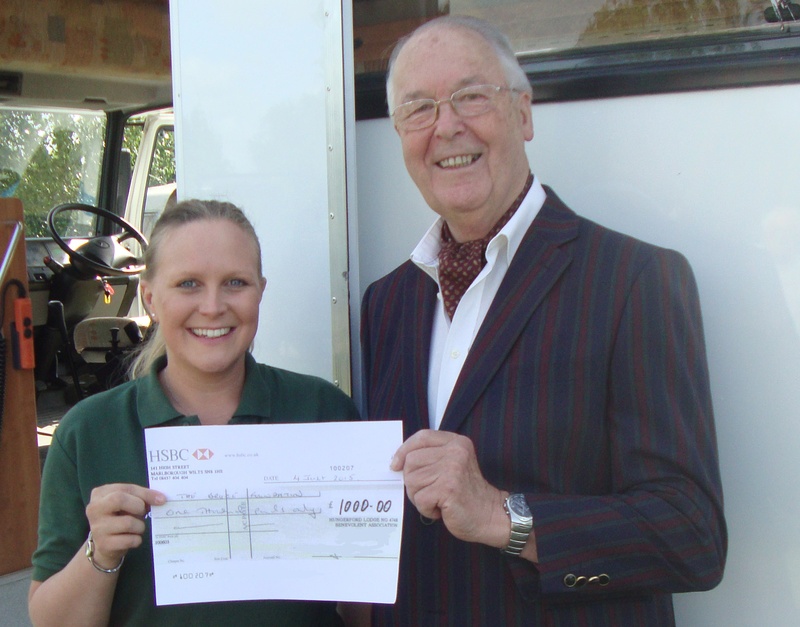 The Berkshire Masonic Charity has donated £1,000 to the Foundation to help towards meeting the £120,000 capital cost of a unique, specially built and equipped motorhome. The wheelchair accessible vehicle, which is now ‘on the road’ is fully fitted with every aid and facility to enable people with disabilities or special needs to have a holiday, including a high end scissor action hospital bed with hoist and track system to a wet room at the rear of the vehicle. 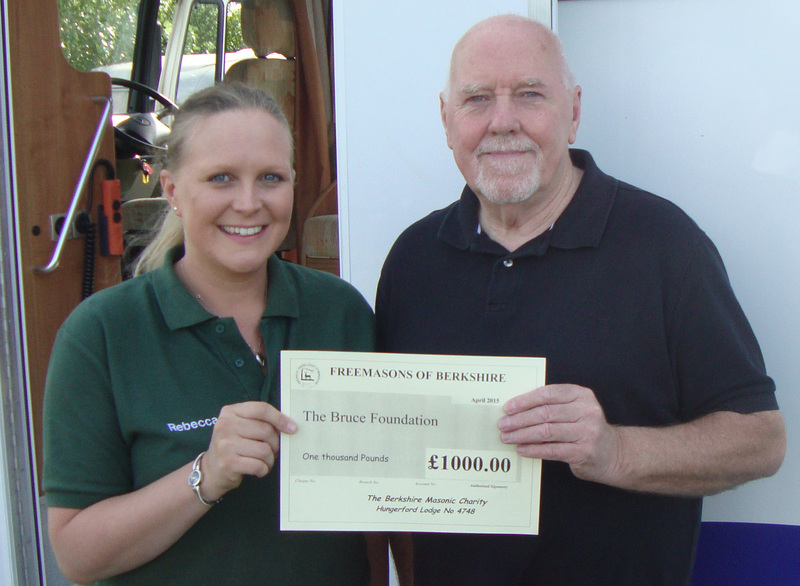 Hungerford Lodge member Ken Phillips, who has been involved in the Bruce Foundation application to the Berkshire Masonic Charity, was so impressed with the sterling work of the Foundation that he suggested Hungerford Lodge might also consider making a donation. The Hungerford Lodge Benevolent Association readily agreed, and moreover, agreed to match the £1,000 given by the the Berkshire Masonic Charity. So on Saturday 18th July, several Lodge members were greeted at Great Bedwyn Wharf by David Bruce and his daughter Rebecca. They were shown around the motorhome and David and Rebecca shared some tales of how the vehicle had already given pleasure to so many who might otherwise not have a holiday at all. The front passenger seat is removable and factory fitted anchor points can secure a wheelchair in its stead. One moving recollection of Rebecca’s was of a young lad in a wheelchair who was beside himself with joy at being able to sit in the front next to his driver dad, something he’d never done before. In what at first sight seems a role reversal, Ken Phillips presented a cheque for £1,000 on behalf of the Berkshire Masonic Charity and esteemed Berkshire Freemason, and honorary member of Hungerford Lodge, Michael Tanner, was delighted to present the second £1,000 cheque on behalf of the Lodge. With the formalities over, Lodge members donned their Marigolds and showed willing to help in getting the Foundation motorhome (and the Bruce Trust canal boat) cleaned and ready for the next hirers.